Soup may be getting most of us through the chill of winter but every once in awhile, I crave the crunch of a salad. It's a way to get in my greens but I secretly LOVE this recipe because it blends my favorite flavors of sweet and spicy in one gorgeous bowl. 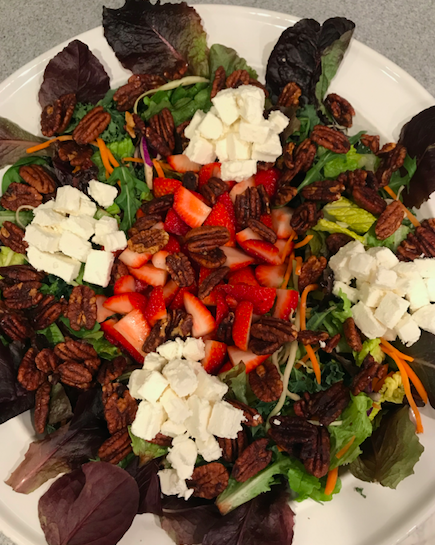 I originally made this salad with beets which is a home run, but this week I came across delicious strawberries and I knew that they would be a perfect substitute. Pears also work, so pick what suits you. Same goes for the cheese. Crumbled blue cheese or even feta can be subbed in for the goat cheese. The pecan recipe will take some extra time in the oven but the result is well worth it. My SECRET GIFT to you: One pound of pecans is more than you will need for the salad but enjoying the leftovers will make you happy all week. I've also discovered that if I'm feeling generous and in the mood to share, they make a lovely hostess gift. Preheat oven to 250 degrees. Line a large jelly roll pan with parchment paper. In a medium pan over a low heat, blend the sugar, butter, orange juice, salt, cinnamon and cayenne pepper until butter melts and sugar is dissolved. Increase heat to medium. Add nuts and toss until coated. Spread nuts on parchment paper in an even layer. Bake about 2 hours, stirring every 30 minutes until crisp and no longer sticky. Cool completely. Store in an airtight container.